Dowlatshahi’s interest in the alphabet is rooted in its familiarity and universality. Green Alphabet, which may be viewed as an English version of Persian Alphabet on Grid Pattern from one year earlier, maintains an architectural sense of space by placing the alphabet within his characteristic grid pattern. 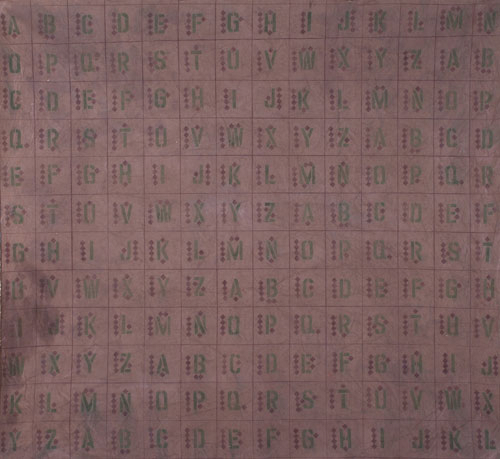 The commonplace nature of the grid and the alphabet contrasts with the more biographical vision reflected in the worked muslin of the untitled G1975.87. Dowlatshahi firmly believed that the observer should gain an understanding of art based on his own experience rather than that of the artist. To him, muslin and the alphabet were equally universal symbols, and Green Alphabet was no less evocative than G1975.87. Dimensions 71 x 75 1/2 in.